I’m headed over to Fayetteville this weekend to do my KCBS judging duty at BIkes Blues and BBQ. Does anyone have any suggestions for breweries to visit. I know I will be going to Saddleboch and the Black Apple Crossing (the only cidery in Arkansas, they use Arkansas Blacks as the base for their ciders) Maybe one more to visit would be nice. If you are a biker and have not made the trip to Bikes, Blues and BBQ yet you need to put it on your must do list. THis is like the 3rd largest gathering of bikes in the USA. See you there. Report - Saddlebock, a bit out of the way but worth the find has some really nice beers, a comfortable tasting room with a deck that has all afternoon layback with friends written all over it. Most impressive beers were the imperial IPA and a blueberry that was subtle. Black Apple Crossing - a cidery in downtown Springdale that is making some nice ciders. They are not bottling anything as of yet, too new, but their standard was brut and excellent and they are making a ginger that I really enjoyed. Another reason to get yourselves on down to Arkansas. Besides in about 3 weeks the fall color is going to be beautiful. Core - was very busy and I did not get to spend time with the staff. Had the IPA, it was very tasty, not too hopped so that it shouted extreme. Love the Weiner Dog. I’ll be back over in 2 weeks and will try to hit a couple of other breweries. I’m thinking Bentonville, Bike Rack and Ozark. Unfortunately I have no first hand experience of the local craft brew scene, although there seems to be plenty of action going on in our recently-wet county. Thanks for the heads up. I’ll be in Bentonville on the 10th judging at the Sam’s Club BBQ Nationals. I’ll probably check it out then. Glad to know there is someone from there posting. Your less than 2 hrs from Tulsa. I’ll be over Saturday and Sunday to judge at the Sam’s Club BBQ Nationals. Any recommendations on a place for Sunday brunch in the Bentonville to Springdale area. I would hold out for 28 Springs in Siloam Springs but the people I will be with will be heading back to the DFW after lunch. Unfortunately I don’t get to eat out often so I can’t offer much for first-hand recommendations. However Tusk and Trotter in Bentonville is highly regarded and has a brunch menu. and the food truck Crepes Paulette across the street, which I actually can recommend and apparently opens at 11 on Sunday. A patio is available there. Authentic, delicious French Crepes, sweet and savory, in an open-air setting. 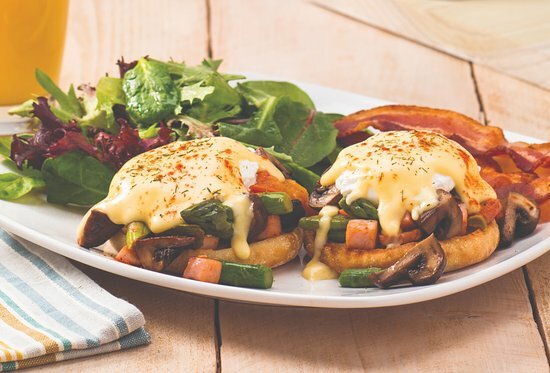 The Egg & I Restaurant, Rogers: See 152 unbiased reviews of The Egg & I Restaurant, rated 4.5 of 5 on TripAdvisor and ranked #2 of 195 restaurants in Rogers. Hope that’s a little helpful at least. Have a great weekend! There’s a really good podcast called Basic Brewing Radio that’s based in NW Arkansas. It’s usually about homebrewing of beer, but the host frequently interviews local craft brewer and talks about the area often. You could look at old episode descriptions to find the names of other local breweries. The most recent episode is an interview with the cidery you’re going to. If you need something to listen to as you travel to the area.